These days part of the annual bonus John O'Donnell, president of Massachusetts Bay Community College, receives is tied to graduation rates. 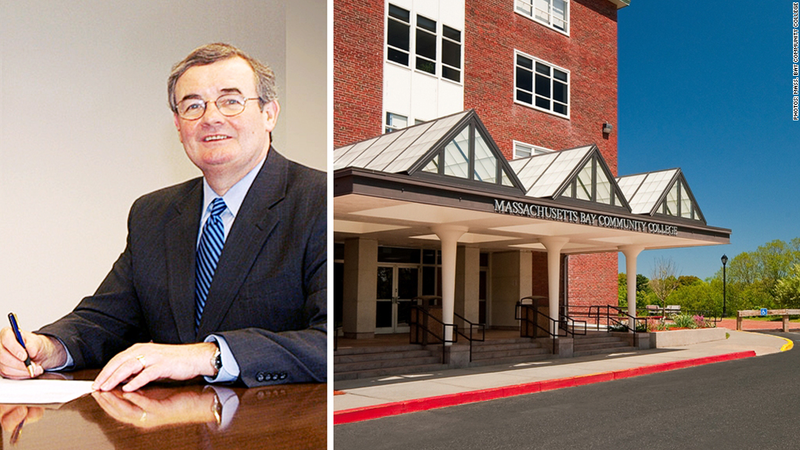 Like most leaders of American colleges and universities these days, Massachusetts Bay Community College President John O'Donnell is under pressure to increase graduation rates and turn out students local employers will want to hire. And like a small but growing number of his counterparts around the country, O'Donnell has a new incentive to meet these goals: What he earns partly depends on it. "College presidents need to be accountable," said O'Donnell, whose board of trustees recommended that, on top of his $211,150 a year base pay, he get the relatively modest maximum incentive bonus of $7,390 to reward good performance. Taking a page from the corporate playbook, college boards like Massachusetts Bay's are beginning to tie merit raises to how well presidents meet performance targets. "Institutions can't afford not to have competent people in these jobs," said Stephen Pollack, a partner at consulting firm Mercer, who specializes in nonprofit organizations, including higher education. Historically, presidential evaluations have been almost a formality, and raises often rubber-stamped, said Patrick Callan, president of the National Center for Public Policy and Higher Education. The process appears to be undertaken "just to justify extravagant salaries, or is way too focused on fund raising," he said. In other cases, "it's like they put the presidents on trial," and every constituency -- faculty, donors, students -- is invited to weigh in, said Callan. "That's just a killer. It creates presidents who won't take risks." The idea of tying executive compensation to specific performance goals has been drifting slowly into higher education from the corporate world. Universities and colleges are increasingly under the same kinds of pressure from parents and politicians that CEOs are from shareholders. About a third of presidents of private colleges and universities are now eligible for so-called variable pay, or pay for performance, according to Yaffe & Co., an executive compensation consulting firm. Of those presidents, 64% received their maximum possible incentive bonuses last year, the agency said, which came to a median of $34,000 each. Public universities are jumping on the presidential performance compensation train, too. This month, for the first time, the heads of the nine universities of the University of Texas System were given bonuses of up to 10% of their salaries based on their cost savings, growth in research grants, fund raising, graduation rates, and other measures. And former Indiana Governor Mitch Daniels, who took over in January as president of Purdue University, is paid $420,000 a year with the potential to earn an additional $126,000 tied to such things as lowering students' debt. Not all of these arrangements have been met with praise. Some critics complain that presidents should not be paid extra for doing things that seem to fall under their job descriptions -- especially with money tight. There was grumbling when the Arizona Board of Regents voted in September to give $40,000 in incentive pay to each of the presidents of Arizona State University and the University of Arizona, who make base salaries of $475,000 apiece, plus more than $250,000 a year in other benefits. Each is due for another $40,000 in incentive bonuses next year and up to $180,000 the year after that if they can trim the cost of employee health care, attract more students and research funding, and lower the number of dropouts, among other things. In Massachusetts, O'Donnell and the presidents of the state's other 14 community colleges and nine state universities will be given bonuses of up to 3.5% based on their ability to raise graduation rates, close achievement gaps, and align educational programs with the needs of local employers. "We're being very clear about the educational outcomes we're trying to produce for the state, with a growing emphasis on performance," said the state's Commissioner of Higher Education, Richard Freeland. As to whether merit raises of only 3.5% of presidents' salaries are enough to drive change, Freeland said he wished the proportion was higher. "It's nowhere near as meaningful as I would like it to be," he said. It's too early to judge how much of an impact performance-based raises will have at colleges, but they have proven effective in the corporate world, said Pollack. "To do it well, you have to be willing to ... communicate with people at the beginning of a year about expectations and goals," he said. "If you're willing to do that and then hold them accountable, it works."